﻿﻿﻿Darling girl is an early riser and a morning learner. Every day she rises, recites her list of questions and plans, and sets it all in motion. This morning the dear child drew herself a map. Soon after, she was really, really frightfully intent on writing number sentences. All before my first cup of caffeine. Normally I'd just let her chatter away and let it all wash over me (it was only 7am after all) but today the tide was just too strong. I didn't really understand why there was such a need to do all this before breakfast but sometimes you just need to act first and ask questions later. 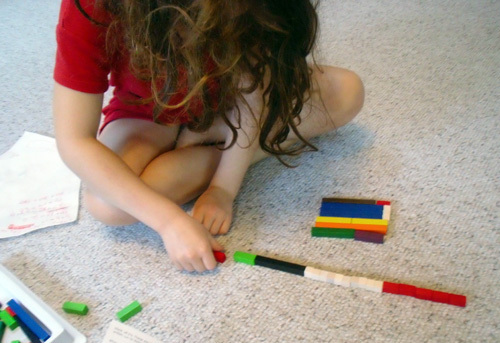 I wasn't completely sure if she was ready to move on to labeling each rod with a unit number or, for that matter, if I really understood how to use the rods to represent addition, or if we were going in the 'right' sequence of learning with these things. But why let any of that stop me? I said, "First, can you just put the rods in order from smallest to biggest?" Done. "Okay, let's look at your first number sentence, one plus one. 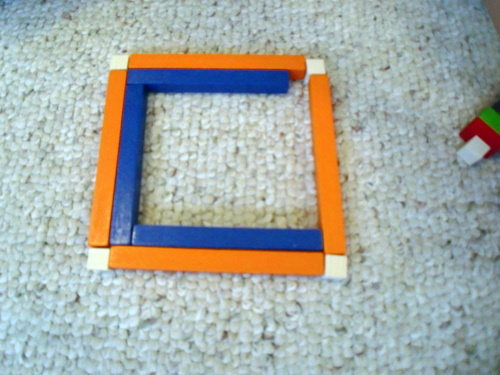 Here are two of the white blocks. 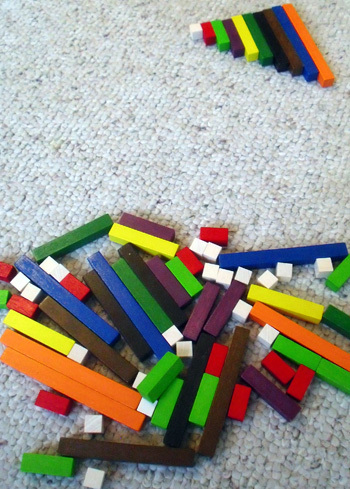 Which block is the same length as two white blocks?" She picks up the red rod. I say, "Okay, how many whites makes a red? So when you write 'two plus two' this is what it looks like. Which rod equals four whites or two reds?" She pulls the purple rod to match. 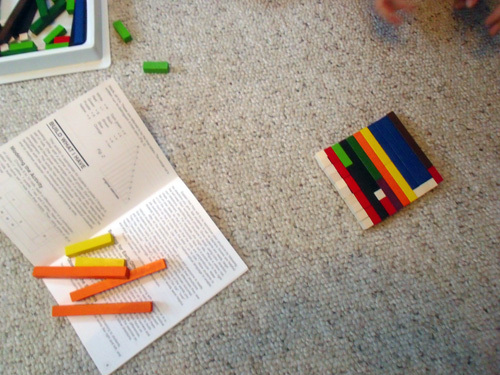 Then I had a bright idea: "Can you figure out how many white blocks make an orange? What other ways can you combine the rods to make ten?" Girl interrupts my line of thought, "I want to make a line of a hundred!" She knows that ten tens make one hundred so she starts stacking them together to make sure she has ten of them before she lines them up. I persist, "How many more ways can you make a ten?" She wanted to see how long a line the ten tens would make when lined up end to end. "Look Mama! I'm 110 units long!" 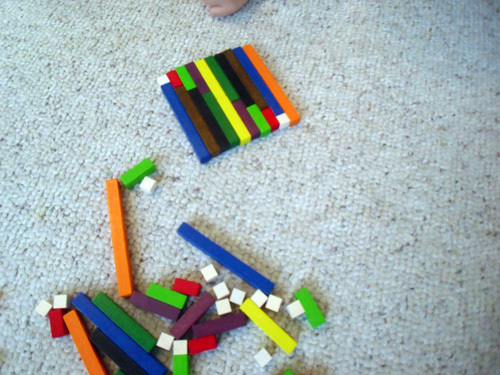 Overall, my biggest takeaway from this morning is that, although she has enough questions to keep us busy for now, I need to do some more research on the best way to use Cuisenaire rods -- quick! 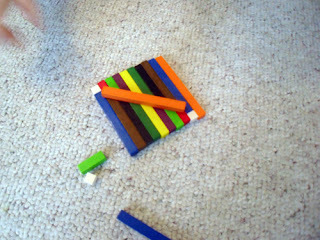 Later in the day I did find out why she was so intent on doing math this morning. It's actually a secret so if you see her don't let on that you know. 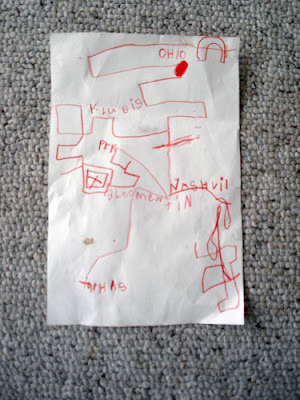 "Mama," she said, "You know why I've been wanting a longer math lesson and have been so interested in maps and money? Because T. [a good friend] and I were wondering what would happen if you [the mommies] stopped loving us and those things would be important to know." Apparently, she and her great friend T. have hatched a sort of secret survival plan for an undefined point in the future when "our mommies don't love us any more." They've decided they need to know how to do math, figure out how to work with money, and know how to survive in the outdoors. After I assured her repeatedly that I will ALWAYS love her, we went to the library to get some books about how to identify and cook with edible plants. She said, "Don't tell T. that I told you. And even if you never stop loving me, it's still helpful information to know." "I won't tell," I replied, "But it's probably good that I do know so I can help you find the information you need. Learning all this will be really helpful when you grow up and live on your own." "But I'm going to live with you forever." 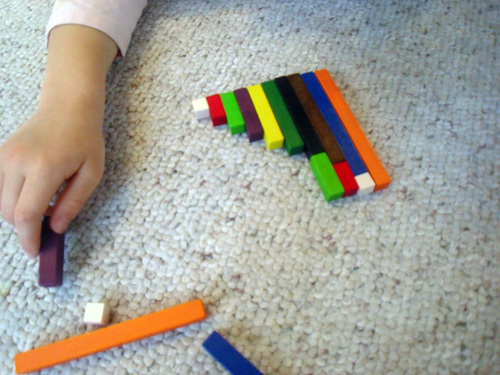 I pulled out the cuisenaire rods yesterday. The set had been sitting on a shelf for almost a year. If you don't know what they are the best I can say right now is that, essentially, they are unit blocks of specific colors designed to (at least at first) help kids develop number sense as well as strengthen conceptual understanding of addition, subtraction, multiplication and division. Girl: "I'm going to put them biggest to smallest..." Mama: "Say it with me! Orange, blue, brown, black... Okay now, with our eyes closed! Orange, blue, brown...Yay we did it! Now smallest to biggest, white, red, light green, purple..."
Mama: "Hey look! A blue with a white makes an orange. Oh, and a red with a black makes an orange, too!" Girl: "Let me do it." 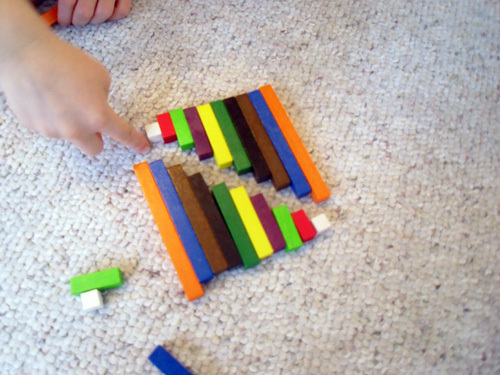 Girl: "It's divided here." Mama: "Oh, I see it, on the diagonal. Let's put a block down to show where it is." Girl: "I want to pull them apart." Mama: "Look, they're in the same order!" 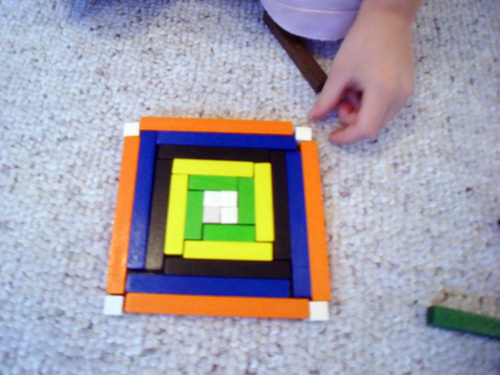 Girl: "Now I want to make a design." What she figured out is that to make this design work you had to skip colors: orange + 2, blue, (skip brown), black, (skip green), yellow, etc. So many more things to do with these -- I can't wait! !